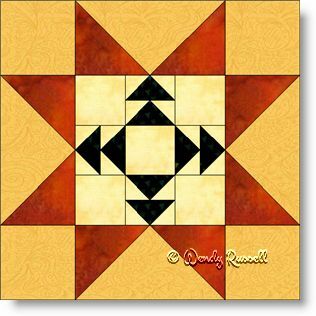 The Campfire Star quilt block is built from the Sawtooth Star block. The centre plain patch in the Sawtooth Star has been replaced with a block made of small flying geese units and squares. This block will allow you to test out your piecing skills by paying close attention to your quarter inch seam allowance. Since the name of this quilt block is Campfire Star I decided to keep with that theme when choosing the colours for the block. Both of the sample quilts illustrated have the quilt blocks laid out on point. However, by adding more or less background fabric and sashing, the looks are completely different.